Udipur (Nepali: उदीपुर) is a town and market place at Besishahar Municipality in Lamjung District in the Gandaki Zone of northern-central Nepal. The Besishahar Municipality was formed by merging the existing Village Development Committees i.e. Besishahar, Gaunshahar, Udipur & Chandisthan in May 15, 2014. Middle Marshyandi Hydro Electricity is located in this place. The famous temple of Udipur Kalika is located here. This place is in the way of Annapurna Conservation Area. The Dumre-Besishahar-Chame highway also goes from this place. Here are different casts and religions. At the time of the 2011 Nepal census it had a population of 2,692(1,482 Female & 1,210 Male) people living in 698 individual Households. 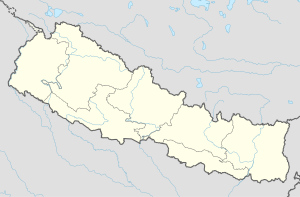 ^ "Lamjung District". District Development Committee Lamjung. Retrieved 2014-09-15. ^ "Population & Ward Division Of Besishahar Municipality". District Development Committee Lamjung. Retrieved 2014-09-15. ^ "72 new municipalities announced". My Republica.com. Retrieved 2014-05-15. ^ "Government announces 72 new municipalities". The Kathmandu Post. Retrieved 2014-05-15.